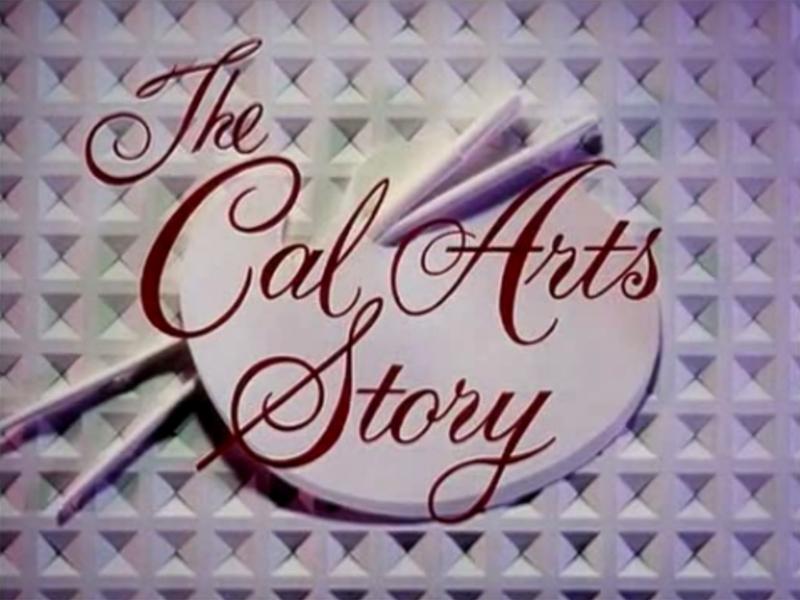 SCVHistory.com TN6903a | CalArts | Trustees Launch Funding Campaign to Build CalArts, 3-19-1969. 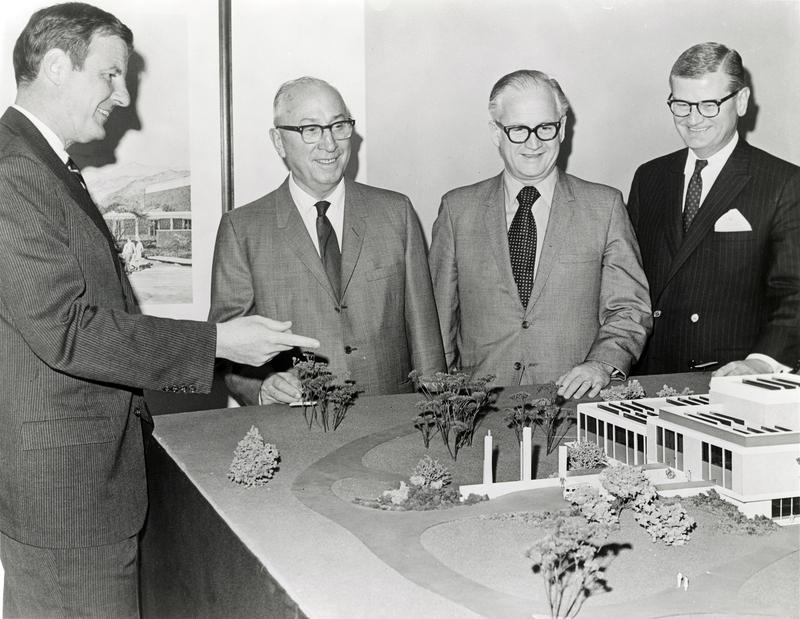 [California Institute of the Arts, Los Angeles, March 19, 1969] — "Launching the fund campaign for California Institute of the Arts (left to right) Dr. Robert W. Corrigan, president, and board of trustee members Roy O. Disney, Harrison Price (chairman of the board) and G. Robert Truex Jr. view the model of the new campus being constructed in the community of Valencia located 32 miles northwest of Los Angeles. The buildings will cost $36.5 million and will be ready for the initial clases in the autumn of 1970s." Webmaster's note: Ground was broken May 3, 1969, but the 1970 academic year was conducted at an interim campus in Burbank. The Institute moved to its permanent Valencia campus in 1971. California Institute of the Arts has embarked on a $54 million development program to establish the first center for professional training in all the arts in October 1970 in the new city of Valencia, California. The announcement was made at a conference held in the University Club by Robert W. Corrigan, President of the Institute; Harrison A. Price, Chairman of the Board; Roy O. Disney, Trustee; and G. Robert Truex Jr., Trustee and Chairman of the Institute's development program. Present too were additional members of the Board and of the academic and administrative staffs. According to Mr. Truex, who is Executive Vice President of the Bank of America, $54-million is the amount necessary to construct the physical facilities, help defray annual operating expenses through 1974, and provide an initial endowment fund for scholarships and instruction. Mr. Truex stated that a major development drive normally is predicated on the assurance at the start of at least 20% of the goal, and of a single gift approximating 10% of the total to be raised. "We are able to report, "Mr. Truex declared, 'that we have met and exceeded these requirements. Through the generosity of the Walt Disney Foundation, the Institute has received a single magnificent gift of $5 million, bringing the sum of contributions and firm commitments to date to $13,518,000.00, or more than 25% of our total objective." California Institute of the Arts is to be located on a 60-acre site, 32 miles northwest of downtown Los Angeles, near Newhall-Saugus on the Golden State Freeway. The Institute will consist of a single complex of six schools, embracing art, music, design, theater and dance, film and general studies. The interrelation of the creative disciplines and the interaction between the campus and the new city rising around it are some of the elements in this unique concept of a community of the arts. Discussing the purpose of California Institute of the Arts, Dr. Corrigan said: "Like every significant idea, the Institute arises from need. Technologically, America has no peer. Socially, we are in a crisis. Today, professional training of the artist demands that we think of the Institute as an environment, a community in which the work itself is the source of the artist's energy and technique. The Institute will not merely prepare him for entry into a profession. The arts are a different way of knowing. The arts here will be a source of knowledge of the artist himself as well as of the society in which he will function." Building of California Institute of the Arts will proceed in three stages, the first to provide facilities for the six schools, the library and main gallery, the administrative wing and student housing. Phase II will provide an innovative modular theatre; additions to the Schools of Theatre and Dance, Film and General Studies, and finish the library. Phase III will provide major rehearsal halls, an 800-seat thrust theatre and two sound stages. Grading of the site was begun on March 10th. Contracts for construction will be awarded in April and formal ground breaking ceremonies are scheduled in May. Completion of the three phases is expected in September 1970, July 1971 and March 1972. Chairman Price expressed the view that "the new California Institute of the Arts is emerging from the past into the present because of a vision held by Walt Disney. Though death had deprived him of witnessing its fulfillment, it did not prevent him from lending substantial assistance. Through his foresight and liberality, the Institute has been able to arrive at this point in its development." The $54 million will finance construction and equipment of the physical facilities at a cost of $36.5 million; operation, instruction and scholarships for the next six years at a cost of $12.5 million; and an endowment fund for a continuing program of instruction and scholarships of $5 million. "In the foreseeable future," declared Mr. Truex, "The Institute will exert a profound influence on the life of California, and of the nation. Opportunities to support it exist for every sector of our population, for the prominent and affluent as well as for the thousands across the country whose modest but no less welcome contributions will help toward its realization." The Institute was designed by Thornton Ladd, of Ladd and Kelsey Architects, utilizing 4 of its 60 acres for a tri-storied structure on varying levels, in a single complex of classrooms, workshops, studios, laboratories, galleries, a student union with dining room and lounges, and eight performance areas, including a 200-seat proscenium theater and a 50-seat changing-form lab-theater. The adjacent dormitory will accommodate up to 360 students. Space provisions will total 718,600 square feet. TN6903a: 9600 dpi jpeg from original 8x10 glossy photograph from the collection of Tony Newhall, whose father Scott Newhall was a member of the CalArts board of trustees.